I can’t believe that it’s already been four weeks since I did the Wings for Life World Run (and have done very little else other than the Ely hosted Kevin Henry 5k League Race and the usual training runs). Time is slipping away from me and there is a decent reason for this (I’m working on a new project) but I’ll explain more about that in another post another day. Long time readers of this blog will know that I did the Wings for Life last year and loved it despite the bonkers blazing heat. I was lucky enough to hook up with two other awesome Ely Runners and loved it so much that I signed up for the 2017 run the next day. It’s amazing how quickly those sign ups roll around isn’t it? The Wings for Life is unlike any other race I’ve ever done. The atmosphere is amazing, and yet weirdly so much more chilled out than any other big city centre race. Admittedly it’s only about 40% the size of the Cambridge Half Marathon (when you take into account drop outs) but it seems so much smaller. And when you have David Coulthard mooching about, taking photos with excitable runners and making jokes about dog’s bottoms, you know you’re on to something special. I had originally arranged to run this with an old work colleague a while back, but due to unforeseen circumstances he could no longer do it, so a couple of weeks before the run I arranged to run it with Justin, a fellow Ely runner, who in bonkers fashion had only run his first ever marathon 6 days earlier. I know. The lovely thing about Justin is that he’s a much better runner than he thinks he is, but he also totally gets my running quirks and just lets them exist with no drama (which ironically makes them less likely to be an issue – it’s being around other highly strung runners that make my anxieties flare). So as we arrived in Cambridge stupidly early, I found myself really looking forward to it. At about 11:40am, we all gathered on the start and Justin and I made sure we stood on the right of the pen to ensure a high five from Mr Coulthard (a lesson learned from the 2016 race). It was about then that I realised that I was actually blooming hungry, and scarfing my flapjack at 9:45am had been unwise. Fuelling for a midday run is NOT easy. But off we set at 12pm sharp, and high five secured Justin and I were off. And boy did we run. The two of us decided we didn’t really care how far we got or how fast we ran, and we took full advantage of the water stations, making sure to stop and fuel properly without pressure. We settled into a really nice comfortable pace, and the weather was absolutely ideal, which was such a relief after last year. It wasn’t until about 15k that Justin’s marathon started to catch up with him and his foot started giving him some gyp, so we slowed down and decided to see if we could just manage to beat my distance from last year (17.89km). 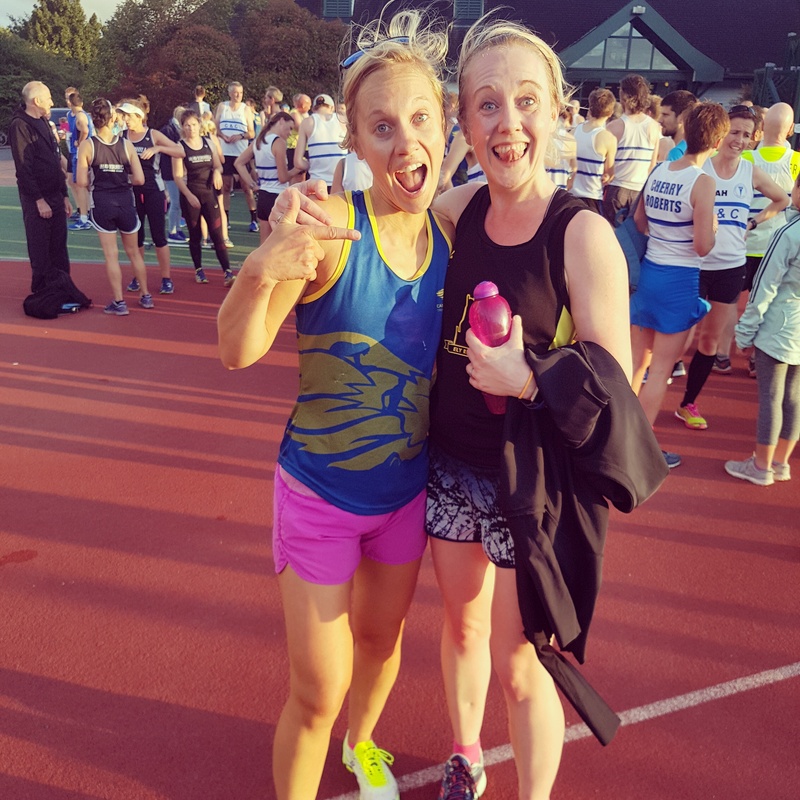 Somehow, the two of us charged on to the half marathon mark, and with tears in my eyes as I realised that this was the furthest I had EVER run, we kept plugging away. It was at around 21.5k that we heard a rumble from the crowd behind us and knew that the catcher car was starting its final chase towards us. So we belted it, praying that we would make 22k. We did, and still the catcher car wasn’t on us, and 23k suddenly seemed possible. With Justin’s blessing I “took the bloody handbrake off” and belted for the 23k mark before finally watching the catcher car cruise past me at 23.25k. Weirdly enough I ended up outside the house of someone I knew (but had no idea they lived in Willingham) and chatted with them until Justin arrived and gratefully accepted a bit of cake (thanks Bex!) before we walked to the nearest bus stop. The bus ride back was insane. It was FULL of runners (my heart went out to those who ended up standing, but not so much that I offered them my seat), and as we drove through all the villages (Willingham was about as far from the start as you can get on the route) we were waved at by hundreds of people. I think that’s as close as I’ll ever get to being part of something akin to an Olympics parade! It was the most amazing feeling, but the buzz was dulled slightly when we saw the queue for the bag collection. Luckily I ADORE this run and won’t say a bad thing about it, but flipping heck that queue was insane. Memo to self – don’t use the bag drop next year unless you really, really have to. You’re better off convincing a friend to come to Cambridge with you and paying for them to stay in the Grain and Hop Store stuffing their face with sweet potato fries while you run. There was zero order to it, and Justin ended up having to find his bag himself after the WFL volunteer couldn’t locate it in the mess. But this was such a small blip. This event is just my absolute favourite (sorry Cambridge half) and I’m praying that they keep it in Cambridge. I’m sure it will still be brilliant if they move it elsewhere, but the awesomeness of the race combined with the perfect location for me is what makes this race truly special. And I have to say the biggest thank you to Justin – he’s INCREDIBLY TALENTED (!) and such an easy running companion. We talked when we felt like it and stayed quiet when we didn’t. It was effortless and I wouldn’t have done half as well without him. He is also a champion photographer spotter and I’ve never had such a great selection of race photos! Same time again next year turtleflea? Sounds fun, and congrats on running so far!! That’s awesome! NIce one. Sounds like a great race. I only ever did one with an (alleged) sweeper but when it came to it, they never appeared. Just a bogeyman to scare away the chancers, it turns out. Sure focuses the mind though, not least when they posted a picture of him a few days before the race, with a baseball bat! How flattering! Thank you. You did me a huge favour too you know! You set an awesome pace, and if we are really honest, I should not have taken part. I got way further than I would have had I been without you. Well done on smashing your record for last year, and of course your distance record! Next year? Definitely! Thanks again!